Streetly Hotel is a friendly hotel situated 200 metres from the North Shore Railway station and only 3 minute walk to the promenade and town centre. It is also central for all the major Entertainments and Clubland. 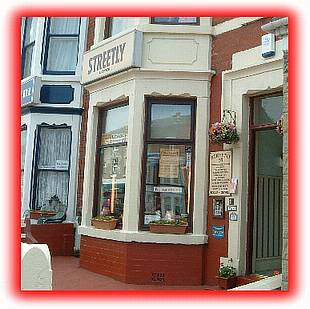 Streetly is not a large or impersonal Hotel, and your hosts Dave and Paul pride themselves on being able to give you the personal service and attention you deserve on your holiday. Blackpool has something to offer for all ages to enjoy and their aim is to help you have a wonderful time. There is a cosy lounge bar where you can relax and have a quiet drink and chat with your hosts and fellow guests. All bedrooms are En-Suite, tastefully furnished and decorated, Razor points, central Heating, tea and coffee making facilities, colour TV’s as standard. Enter the dining room and Kenny will look after your meals. Having been a chef for over twenty years, taking charge of meals for Royalty on three occasions. Free Wi Fi available to all guests. Place Categories: North Pier, North Pier Couples, North Pier Families, North Pier Gay Friendly and North Pier Groups.